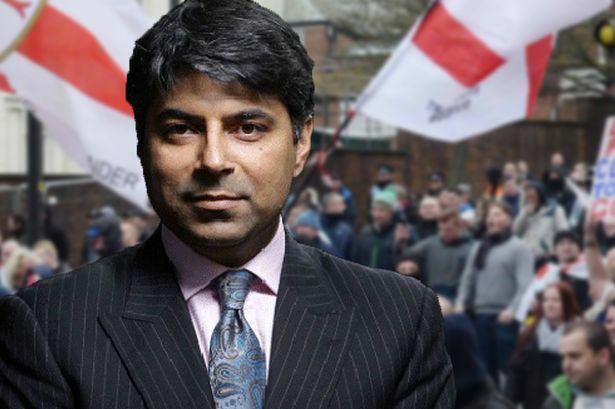 Afzal Amin, standing in the marginal seat of Dudley North , has insisted he will mount a "robust defence" of his action. Mr Amin is accused of scheming with the EDL to announce an inflammatory march against a new "mega-mosque" in the seat and then take the credit for defusing the tensions. Mr Amin, who claims he was the target of a sting operation, will face a disciplinary hearing and reports indicate he could be sacked as the Tory candidate in the target seat within days. The would-be MP was reportedly filmed by former EDL leader Tommy Robinson, who blew the whistle on the plot because he objected to being used as a pawn. The candidate, said to have been described on his Tory Party website as a former Army education officer to Princes William and Harry, outlined his plan to Mr Robinson and current EDL chairman Steve Eddowes at an Indian restaurant in Birmingham on Monday. The Mail on Sunday reported that the 40-year-old allegedly suggested EDL members could be paid to canvass on his behalf, and floated the idea of a phony protest - just weeks after a real demonstration in Dudley by 600 EDL supporters led to 30 arrests. Mr Amin told the BBC Radio 4 Today programme what was suggested was "very normal conflict resolution, confidence-building measures". "If people do announce that they are going to do an action, and other people disagree with it, then they sit together and they resolve their differences and the action is then stopped; then this helps the communities feel that &apos;Yes, on the other side there is a working partner we can work with&apos;. "That&apos;s what we were trying to stage-manage." He insisted that the second march was proposed by Mr Robinson in a meeting at the Toby Carvery in Dudley. "There is no way that I would have the confidence to propose such a manoeuvre to the EDL leadership. "He is the one that proposed, absolutely, that we would do this march and then we would negotiate a way out of it. "When he first came to me he presented himself in tears, saying that he wanted to see an improved Britain. "I didn&apos;t realise this was the start of a year-long sting operation. That&apos;s really what I&apos;ve been subject to here." Mr Amin said he would make his case to the Conservative Party at Tuesday&apos;s hearing. "I want to make a robust defence of my actions and I want to assure that party that I am a loyal party member and a party supporter and I look forward to seeing a Conservative victory in May and David Cameron returned as Prime Minister," he said. Labour&apos;s Ian Austin held Dudley North in 2010 with a majority of just 649 and a decision to sack Mr Amin would leave the Tory campaign to win the seat in disarray. Mr Amin said he had not had the chance to discuss the proposed second march with West Midlands Police but insisted "that was exactly what was going to happen next". "As soon as the EDL would have announced that they were going to do a march, that would have been the right time to bring in everybody and say &apos;This is what we are hoping to achieve and this is how we are going to do it&apos;. "What we tried to do with the previous march they had was we met with the members of the EDL to try and convince them not to march and they said &apos;It&apos;s too far down the road not to march now, too many people are coming&apos;." He insisted that "on the day it was a very peaceful event" but added: "The first march cost us, in Dudley, £1 million between the policing operation, the loss of earnings for traders and the council&apos;s costs. "That has to be avoided at all times in the future. So we can&apos;t have it, in six months&apos; time, the EDL come again. "The point of having a march that would be announced and then negotiated down was to develop a model for building bridges and confidence-building measures between these communities." Mr Amin said he stood by his desire to see a "united Britain where we all live together". "The British Muslim community isn&apos;t going anywhere, supporters of the EDL aren&apos;t going anywhere. We all need to share this space on our island. The more we understand each other, the greater that unity can be," he said. Asked about Mr Robinson&apos;s claim that he was told he would be "looked after" if Mr Amin won the seat, the would-be MP said: "When a man is in front of you in tears because he can&apos;t provide Christmas presents for his children, you have to extend a degree of humanitarian compassion to him. "I did say that to him - &apos;Look, if I&apos;m eating, you won&apos;t go hungry&apos;, because that&apos;s a normal human response."